Our Bottle Tag range is in keeping with our perpetual efforts to supply novel advertising and marketing products across all sectors. 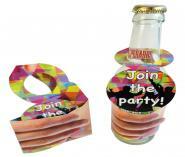 The collection of drinks marketing items from Popupmailers.co.uk compliments the other ranges perfectly. On-bottle promotions such as bottle tags have been around for a long time, however a walk around the drinks sections at our local supermarkets tells us that most of the creative ideas have been around for a long time, too. 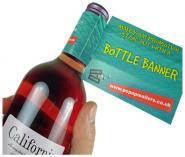 That is why Popupmailers.co.uk designed new bottle tags to liven up marketing wine and drinks a little. There are new bottle tag options which are bound to catch the eye of the consumer and boost the chances of your drinks promotion becoming a success. We have kept some old standards in the bottle collar range just for completeness but there are many totally new wine tags and drinks marketing products which will brighten up this corner of the advertising world. 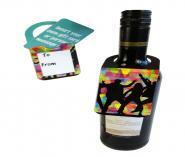 Our bottle tag designs are quite varied. Here is a brief explanation describing the different ways that the bottle hangs attach to the bottle neck. Bottle Collars have a wide collar that wrap around and cling to the bottle neck just like a collar or a scarf, the most popular version of this is the Bottle Tower although a close second are the Bottle Bow and Bottle Balls. Bottle Hangers (also known as a bottle hangs) have a large hole at the top which drops over the bottle neck allowing the drinks promotion to hang loosely on the bottle shoulders. 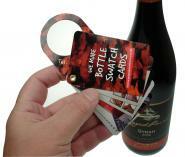 Bottle Tags (also known as Neck Tags) have a loop of decorative string attached which slips over the bottle top allowing the wine tags to rest on the neck and shoulders of the bottle. 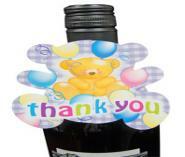 Each style of bottle collar is an easily recognised style of drinks promotion but we have added some flair. The simple cones and towers which sit on bottle necks have been around for ages but they don’t really offer much room for print and nor are they particularly eye-catching. We have taken the basic bottle tags design a step further to introduce three interlocking collars which stand proud from the bottle neck not unlike the style of a bow tie. We have produced our 'bow' style bottle neck tags in six simple but attention grabbing shapes – a flower, a rosette, a teddy bear, a star, a love-heart and a butterfly. There are a few distinctive styles of bottle collars. The Collar and Tie is a highly effective but extremely simple drinks marketing product which gives a much more striking display than you would ever imagine. Bottle Balls offer an unusual shape which could easily be adapted for drinks promotions associated with sports because of the balls. The most “in your face” product is the Bottle Banner. You have heard of shelf talkers, well this is a drinks marketing product that shouts and bawls at the top of its voice! 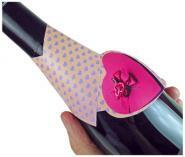 You will often see how wine waiters wrap a napkin around the neck of a bottle of wine; this gave the creative team here at popupmailers the inspiration for the bottle collar that we call the Luvvy Label. This is perfectly at home snuggling a bottle of wine but can also fit on carry handles with no fuss. 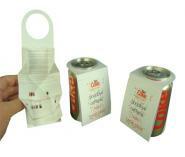 We also do a 'collar on a can' drinks can neck tags for soft drinks or beer, spirits and cider cans. We have introduced a number of new wine bottle tags that offer vastly increased print areas in order to give your wine marketing promotion extra dimension. 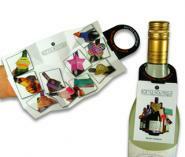 One bottle collar or bottle hang incorporates a credit card sized example of the popular folding pocket sized print – a Starburst. This is an unusual concept for a bottle collar but why not? It is more likely that the bottle collar or bottle hanger will perform its function if a higher level of creativity and innovation is applied to its design. We think that this is ideal for wine marketing and the funky way that the display unfolds might be particularly well-suited to a sparkling wine. Combining pocket sized mini brochures with new concepts for bottle hangs and accessories for wine and alcohol marketing makes perfect sense. Pocket booklets such as the ever-popular Starburst, has proven its value in the marketplace as the type of product that does not get thrown away. You have to assume that consumers buy the bottle of booze first and foremost for the purpose of drinking and an uninspiring on-bottle promotion could easily end up in the bin without being read. This is why you need wine tags that will catch the eye and then be kept for at least as long as it takes to read the promotion. We have produced a Foldilocks Card / Bottle Hang Combo which offers masses of options for special offer vouchers and special offer news which could prove ideal for wine and alcohol marketing. 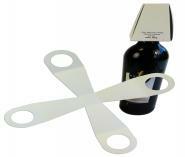 The Swatch Card Bottle Collar are wine bottle tags that find their way into pockets and handbags and desk drawers alike. Our Roll Fold Bottle Hanger is a close relative of the Foldilocks but with a different way of fastening. For those who like the idea of having extra area for print but who can’t fill a Foldilocks card then we have introduced the Gateway bottle hanger – a very neat but simple bottle hang that offers six credit card sized panels for alcohol and wine marketing print. Our promotional product range is full of die-cut products and examples of pocket sized print so the production of bottle collars, bottle tags and bottle hangs – a product which can combine both areas of expertise – is an obvious addition to the drinks marketing range. 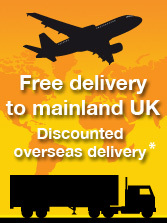 Promotional bottle collars can come in all kinds of shapes and sizes. The most basic example would be like the bottle hangers that we call Standard Bottle Collars which are simply die-cut and creased pieces with a hole to slip the collar over the neck of the bottle. 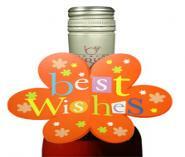 We also make these wine tags in 4-page versions. 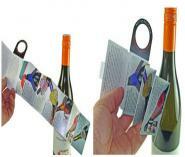 One opens left to right from the side and the other opens top to bottom to create long, slim attractive bottle hangs. Different folding methods can be used to incorporate a little booklet or the bottle collar / bottle hanger can include a simple 4-page section for extra text. 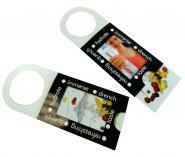 Shaped bottle collars and bottle hangers are also an easy option for drinks, wine and alcohol marketing – the neck tags could be shaped like a lemon, for example, or slices of lemon and lime or cut to shape to look like ice cubes. There is really no limit to the shapes that could be produced for promotional bottle hangs and we will be very happy to discuss custom bottle tags with a more creative design element. Bottle collarsare also produced in shapes like cones or sloping square towers so that they can slip over the long necks of wine bottles. These type of wine tags have been around in alcohol marketing for a long time but we include them in our range just for the maximum choice factor. 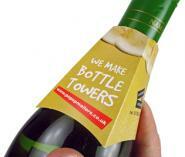 Our Bottle Tower examples are printed on 350gsm silk artboard but that is just because we like our products to be good quality. If your spec calls for a lighter board that does not present a problem. The Bottle Cone and Bottle Tower are supplied with the side seam glued and folded flat ready to ping open and drop onto the bottle necks for a traditional look in alcohol marketing. 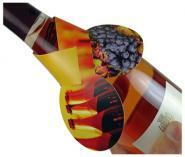 Single leaf and four-page bottle tags are another popular choice as a bottle collar or bottle hanger in wine marketing, incorporating a loop of metallic string which would be slipped over the bottle neck. The standard 4-page bottle tags are the same size as a credit card with the option of being presented in either portrait or landscape aspect. Unfortunately, as we do all of our stringing by hand, we would be cost effective only for smaller orders for these types of wine tags. However, we do have a few examples of shaped single neck tags in our range of wine marketing products which might spark off some creative ideas. 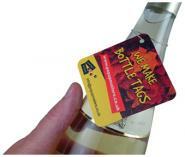 We can make shaped 4-page bottle tags as well. 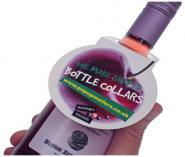 We have also designed some new bottle collars like the Bottle Banner with a simple interlocking mechanism that gives them the versatility not only to fit on wine bottles but also on bottle styles that are more commonly associated with household cleaners – plastic bottles with trigger action spray heads and also bulky bottles with hefty carry handles. With a happy coincidence, these bottle collar products look equally at home on any one of these bottle styles and when placed on carry handles they do not impede the carrier.